A: Your panes will be washed by a team of verified and background-checked window cleaning specialists. Q: What services does window cleaning Lampton offer? A: The cleaners will achieve exterior window cleaning with the help of present-day water-fed pole technology on the market. For properties above the fourth floor, we'll send in seasoned abseilers for rope access window cleaning. For interior pane polish, the team will resort to standard ladders and squeegees. A: A handful of raindrops won't sabotage the Lampton window cleaners' work – rainwater is usually mud-free. However, if we face a cloudburst, then we will kindly ask you to re-schedule your booking for another day. A: As long as the specialists can pass through your front gate, they can rinse away all dirt without you having to be close by. If your panes need a thorough interior polish as well, then we'll arrange a quick key pick-up and delivery service. A: Usually, the purified water storage inside the team's washing vehicle is always full. In case the tank is empty and with your approval, the specialists can effortlessly link the water-fed pole to any accessible water source. With our window cleaning in Lampton, you get a quality rinse of your sash windows, skylights, conservatory roofs, French doors, and other glass surfaces at modest rates. We will even provide you with a free of charge treatment of all PVC & UPVC window elements! For a detailed list of our prices, please check our price table below. With window cleaning in Lampton, we can improve the appeal of your building even if it brushes the clouds above. Let's review what you'll get once you go for our adaptable service. For external window rinsing, the Lampton window cleaners will deploy a extendible water-fed pole. A water pump inside the specialists' van will pump filtered water up the hose and out of a brush-head extension. The water, together with the brush-head, will remove any traces of mud from the casements of any four-storey domain. With rope access window cleaning, the pros will use safe climbing gear to reach even the uppermost storeys in your commersial or home property. We possess all required COSHH documentation and risk appraisal reports and can send them to you as soon as you need them. Moreover, we constantly check the washing gear to ensure that your appointment will go according to plan. And to dight every interior corner of your glass surfaces, the skilled team will use the established sponge and ladder cleaning method. 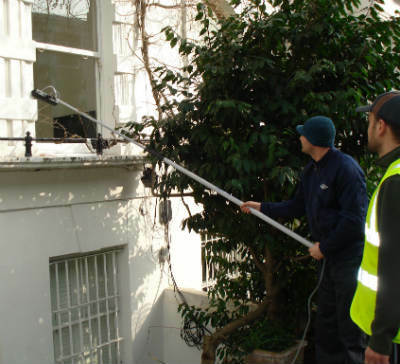 In our aim to cater to as many Londoners as humanly possible, we've expanded our window cleaning in Lampton to cover extra locations across London. For your convenience, we've listed the names of these close by locations below. For those of you who'd rather book window cleaning services Lampton TW3 online, fill in our get a free instant quote form.